This month I decided I’d make some new dresses for the girls. It’s always hard to choose from all the great fabrics in the Miss Matatabi shop, but I decided to start off with Clothesline Floral from Kim Kight’s new Lucky Strikes collection because I thought the floral was sweet and perfect for some back-to-school outfits. It comes in two color ways, red (seen here) and periwinkle. The funny thing is, I had a very strong vision for Yuki’s dress. I had sketched it out, I was excited about it, I’d pondered the fabric combinations and carefully planned the construction. So when it came time to make the dress, I knew exactly what I was doing and went for it. It came out ok. When it came to Kaya’s dress, I had no idea what I was going to make. 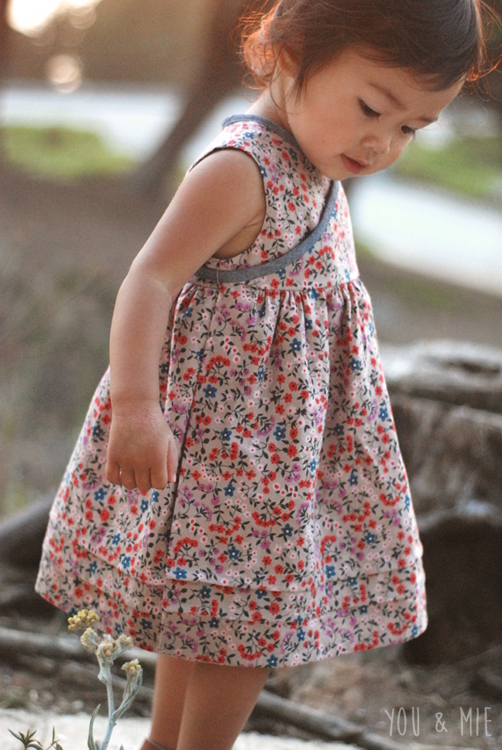 Then one day I happened to pull a dress out of the back of the closet that I had made 4 years ago for Yuki. It was a wrap dress that I had drafted based off a store bought dress. I reminisced about how I used to just make things and draft my own patterns even though I had no idea what I was doing and sometimes they’d work out and sometimes they wouldn’t, but at least I had tried and was taking risks and learning. I feel like I lack that boldness these days and get lazy, depend on patterns too much, or feel too scared or tired to be creative. Anyways, that old wrap dress was pretty cute even though the fit was never great, so I decided to recreate it one more time, but hopefully do a better job, using what I’d learned in the meantime and starting with a reliable pattern to modify instead of drafting from scratch. I had a good chunk of time that day and was able to finish the dress practically in one go. And I love it. Even more than the one I had planned out for days. It’s simple, but it’s pretty darn lovely. Funny how things go sometimes. I started with the Geranium Dress pattern by Made by Rae. That is my “go to” dress pattern for kids. 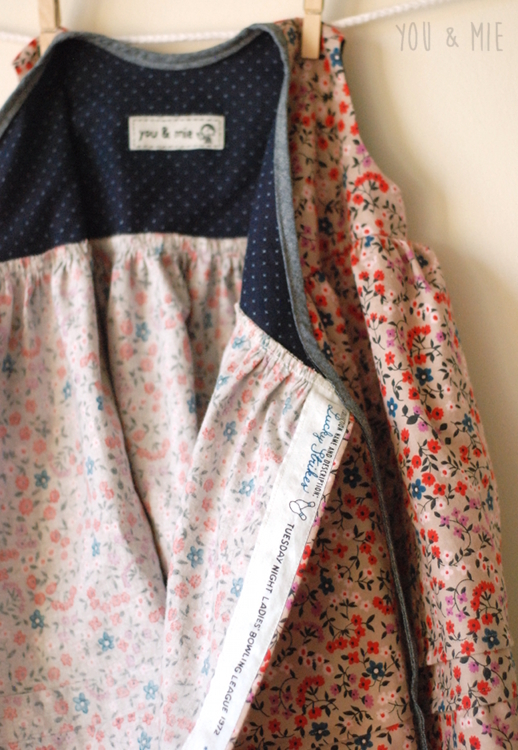 I use that bodice as a starting point for almost all of the dresses I’ve made for the girls. So for this dress, I altered the front bodice piece to swoop down and across to the other side. For the back, I made it into one piece, omitting the button placket/closure. I lined the bodice with another Cotton + Steel print, Add It Up (navy) from the Paper Bandana collection. It may look like little white polka dots, but they are actually plus signs (hence the name). It’s super cute and subtle. The neckline/ties are made from an extra long bias strip from some chambray I had in my stash. I made a buttonhole in the side seam of one side to allow the tie to pass through, and on the other side I made a little thread loop to keep the tie in place. Overall, the dress construction came out quite well! I thought the selvedge design was so sweet, I just folded and sewed it down so it would show along the inner edge. I love those little bowling pins. The skirt is three gathered rectangular panels, with lots of volume, and I added pin tuck pleats above the hem. A cute vintage-y kinda detail. The fabric is quilting cotton and though I don’t use it often to make garments anymore, it was lovely to sew and is great to the touch. It is high quality and has a nice weight to it. The girls love their dresses and I know they are easy to throw in the wash for cleaning, so I’m happy about that! 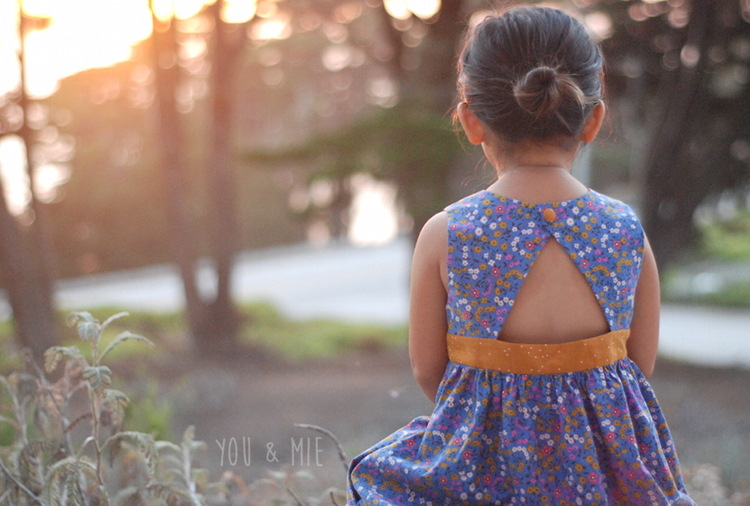 Be sure to check out Yuki’s new dress over at Miss Matatabi! I started with the same pattern (the Geranium) and ended up with a very different dress. 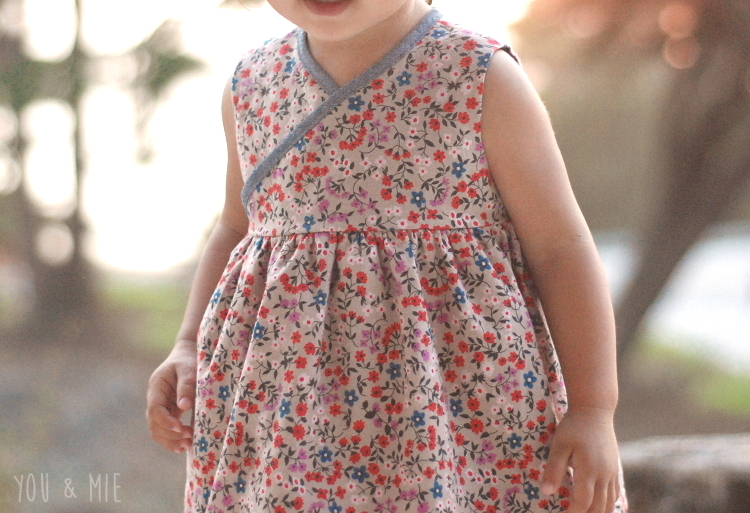 This entry was posted in Miss Matatabi Makers and tagged cotton + steel, geranium dress, kids clothes by Cherie. Bookmark the permalink. I simply love the first dress. It is soo beautiful!! 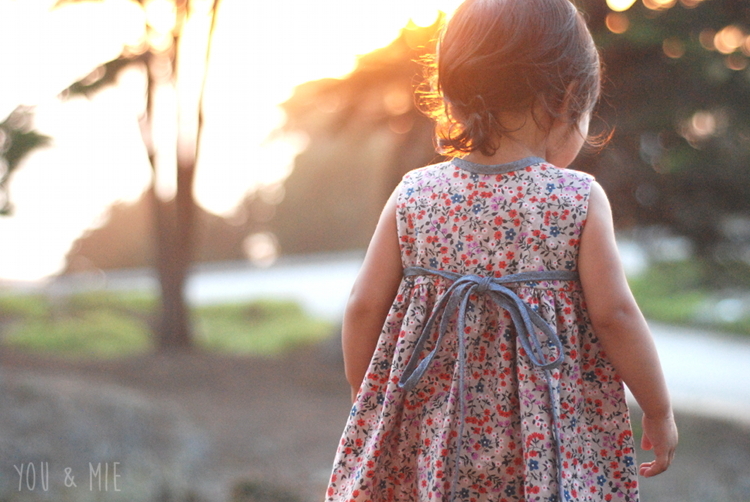 Great dresses, your daughters look adorable! Hi! I absolutely love these dresses! May I post one to my Instagram? Thank you so much for using my fabric! Yes, of course! I’d be honored! Oh! The first dress it’s soo cute! I love it. oh man, dude, this is just perfect! the fabric combo and dress style go together so well, and it fits her beautifully! i want to make one! love seeing you flex your creative muscles again. off to check out yuki’s dress…! What a gorgeous dress. Love the hem tucks and the wrap around bodice! 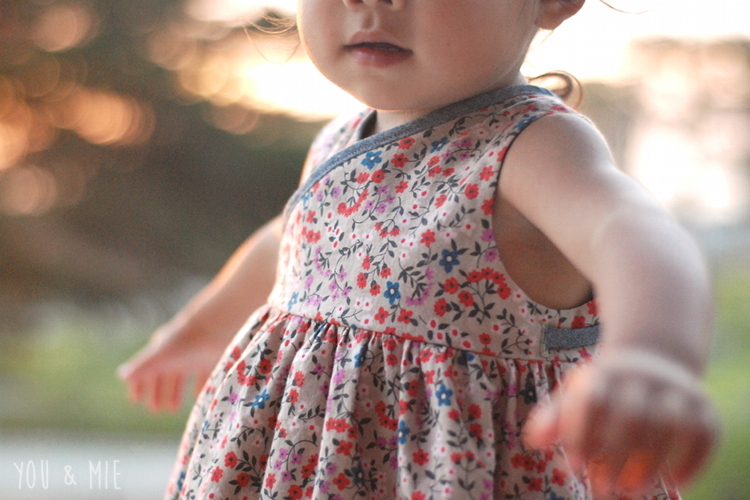 Oh and when did this little baby start walking around and wearing dresses. Time flies! Oh wow, this is just perfect. 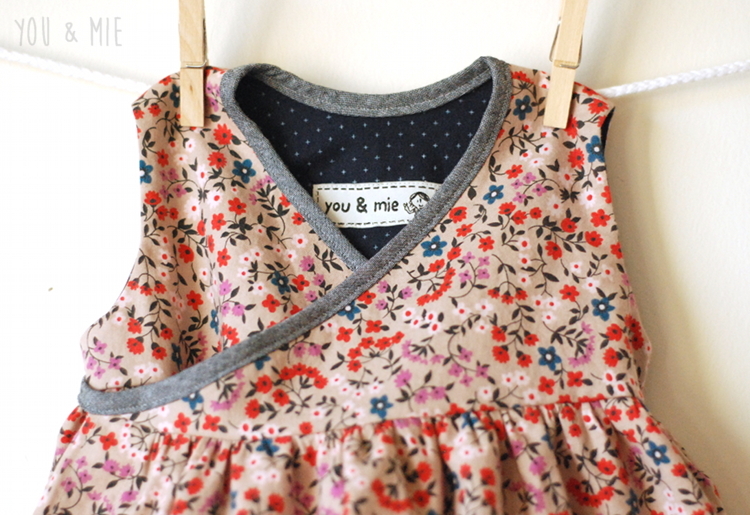 I’m going to try to reproduce this for my little girl, she won’t wear anything with buttons so this would be perfect! It’s so pretty! Great job, I was reminded of the Betsy Johnson dresses I used to make for Jude in sweet ditsy prints! I still have one with a pinafore, in our trunk! Great dresses, this is just perfect! These dresses are just so cute!! These are two great bodice ideas. Wow, I love the pin tuck pleats along the hem – very vintage chic indeed! You are so good at picking complementary fabrics. This dress and also Yuki’s dress are great fabric combos. This dress is so darling!! I love this & Yuki’s. 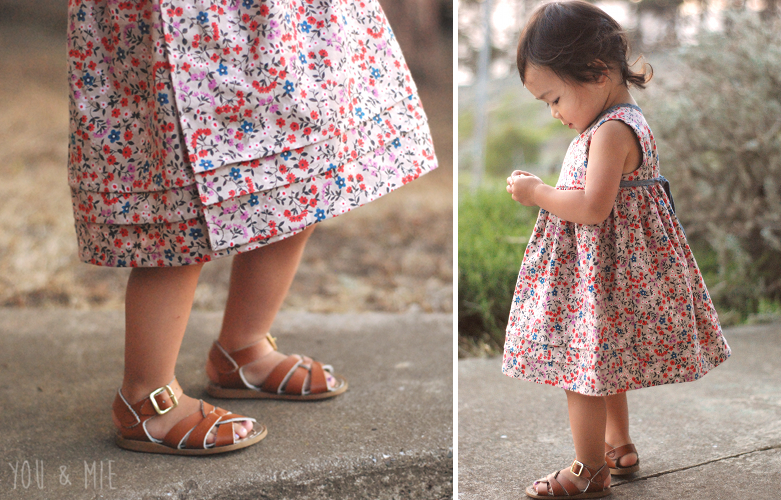 Great idea on turning the pattern into a wrap dress! All my mommy followers, you must check out these super cute clothes! This is such an adorable and thoughtful website! Love it! oh my God! I’m in love with this little girl!! beautiful blog!! would love for you to check out mine at http://glitterboxblog.wordpress.com every visitor greatly appreciated!! Thanks so much!!!!!!! The first dress it’s soo cute! I love it. That dress is gorgeous! I’ve got a 21 month old girl and just had another; this is definitely something I will have to make for them. It’s beautiful!